For 2019 we have chosen to give our support to the Glitter Global Grant again. This Grant was started by Glitter and Dance in Brisbane in 2014. For the past four years they have had the opportunity to help bring the joy of dance to under privileged children in Sri Lanka; funding weekly dance classes, instructors, costumes and their end of year performance. Glitter and Dance have an unyielding passion for all things dance and take pride in helping children who under normal circumstances may not have the opportunity to experience the joy that dance can bring. Donations are managed through Rotary here in Australia and the Rotary Club of Metropolitan Colombo. Project: Dance Classes at Gamini Vidyalaya May 25, 2015. Supported by: Glitter & Dance; Dance Company of Australia. Project Started: March 1 st 2014 – Sri Lankan/Local Dance classes, November 1 st 2014 – Ballet/Western classes. 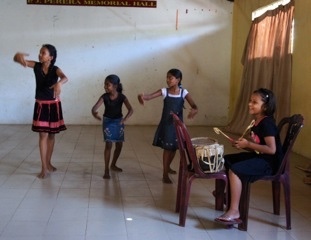 Gamini Vidyalaya dance classes are sponsored by the Glitter & Dance; Dance Company for about 20 children. These classes are held every Saturday from 8am-10am at Gamini Vidyalaya. There are two separate classes – 1) Sri Lankan/Local Dance class and 2) Ballet/Western Dance class. Dance classes not only help the children to learn the skill of dancing, but they also help them to spend a Saturday morning constructively learning a new skill while enjoying each other's company - these are children from poor backgrounds and they can go astray very easily with nothing to do on the weekends. Wendy and Rob celebrate the vision of Glitter and Dance and we join them to celebrate dance in the hearts of all children across the world, all of who were born to sparkle.